Rain ending this morning. Sunshine breaking out this afternoon. High near 70F. Winds WSW at 15 to 25 mph. Chance of rain 40%. Winds could occasionally gust over 40 mph.. The wheels are turning to improve cycling conditions in Napa. 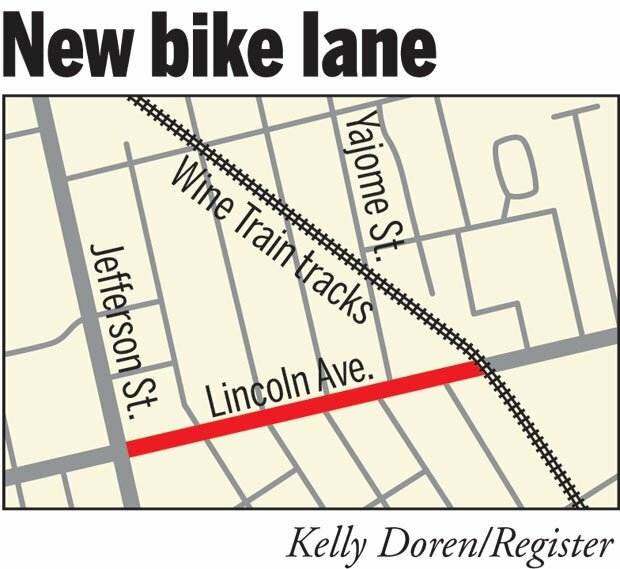 The Napa City Council appropriated grant money this week to purchase and install more bike racks and lockers downtown and to add bike lanes to Lincoln Avenue between Jefferson Street and the Napa Valley Wine Train tracks. “It’s a good way to provide additional support for bikers in our town,” said Helena Allison, an associate civil engineer for the city. The Class II bike lanes — lanes on the street specially marked for two-wheel transport — are an attempt to help students get to school more safely, Allison said. Napa High is just a block away from Lincoln at Jefferson. The new bike lanes on Lincoln will connect to a bike trail that runs at a diagonal through the city along Wine Train tracks. Lou Penning, president of the Napa County Bicycle Coalition, said there is a need for bike lanes around schools. He hopes as more become available, more students will cycle to school, get healthy in the process and minimize before- and after-school traffic that only seems to be growing. Napa has a ways to go to become a bike town, but this is progress, Penning said. Current bike paths are used an “awful lot,” he said. Allison said the lanes, which are being designed by city staff and could go out to bid in the spring, will not affect on-street parking. “Class II bike lanes are usually between the travel way and parking, and the travel lane and sidewalk in places where there is no parking,” she said. In addition to striping the road for bike lanes, the city will also lay an underground electrical system that should connect nearby traffic signals with one another. “We’re hoping that will improve our being able to coordinate the signals,” Allison said. The entire Lincoln Avenue bike lanes project is budgeted to cost about $361,000, using grant money from the Bay Area Air Quality Management District, gas tax revenue and state Congestion Mitigation and Air Quality funds, according to a staff report. The bike racks and bike lockers will be paid for through a Transportation Fund for Clean Air grant, also from the Bay Area Air Quality Management District, according to the staff report. The $10,443 grant will buy approximately 30 bike racks of varying types and two bike lockers, Allison said. 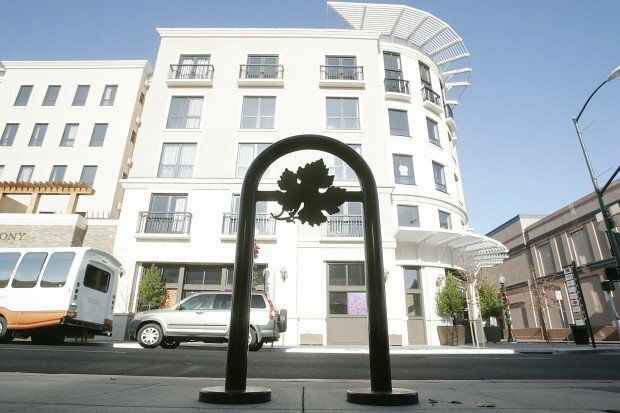 Some of the racks will be custom-made to match the U-shaped racks with grape leaves that were installed downtown in recent months, also using grant money. They will likely be placed outside businesses that have requested them, Allison said. Penning said bike lockers, which can be used by people storing their bikes overnight or when it’s raining, fill up fast but are useful to those who claim them. “They reduce one more obstacle when the building manager says you can’t bring your bike into the building,” he said. The racks should be installed over the next year or so, Allison said. If you want to do something for cyclists FIX THE ROADS!! Cars will benefit also. I'm not disagreeing with you, but the Post Office is just swimming in extra money right now. Write to your postmaster and ask for several decorative bicycle racks. It would be even better if the new bicycle lanes came with a free class on the laws of riding. Specifically staying off the sidewalk. Even where there are bicycle lanes, I have been knocked off the sidewalk by ADULT riders who choose to use the sidewalk. Dangerous for everyone. It would be nice to see some funds go for a few signs explaining to unknowledgeable riders, that when they come up fast at the back of a pedestrian, it is common courtesy for them to announce they are there and explain themselves (for instance, I'm behind you and will pass on your left). There have often been times when I have only known there was someone behind me when I have heard a sound, turned and have had to jump to the side while the bicyclist has never said a word. A good place to start would be along the wine train paths (and both in English and Spanish please). If the city can not afford this safety precaution, could a scout be found who could take on this task? Great news on the new/additional bike rack(s). Long overdue! I have always wondered why when I went to the post office downtown there was no bike rack! All public bldgs, city/county/state/federal should have bike rack(s) out front for public use. Looks like a decorative grape leaf on the bike rack to me. They are likely more expensive and a waste of taxpayer dollars. You can make do with the basic bike rack. It would be cool if the bike racks were decorative. In my town the bike racks downtown are metal but the metal is shaped like for example a bike. Or they could have one spell out Napa. It's just more decorative than a standard bike rack and they look pretty cool. Bicycle lanes are great, especially around schools. What about pedestrians, especially around schools? There are numerous streets around Napa that do not have sidewalks. A good example (one of many) is Browns Valley Road west of Highway 29 all the way to Browns Valley Elementary School. A child must walk in traffic lanes (with heavy, fast traffic) for more than half of that distance. To use what sidewalks that do exist, a child must cross Browns Valley Road several times to get to the side of the street that has any sidewalk at all. I have been told this is an issue where city/county codes contradict each other so this will never be fixed. Why can't the city and county solve such a problem. Don't they talk to each other? That's why I drive an electric car. Much more independent than antiquated internal combustion cars. This is great news. I hope we continue to make Napa more bicycle-friendly. And how about thinking of pedestrians, too? There are many places around town where it's really dangerous to walk: Bel Aire plaza, east Imola Ave., anywhere with those horrible cracked sidewalks. Bicycle lanes on Jefferson and Lincoln would make going to school and work safer for both student and staff. Bicycles provide independence and a freedom that can not come from the internal combustion engine.